On Kauai there are tons of things you can do on vacation, like riding in a doorless helicopter (highly recommended! 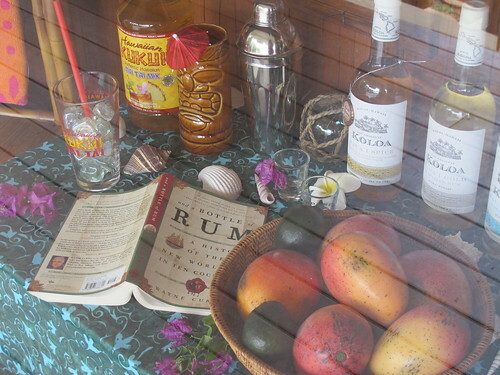 ), ATVing, hiking, kayaking… and free rum tasting! 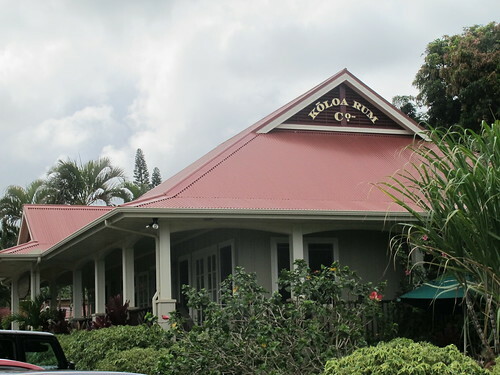 In 2009, Koloa Rum Company began bottling their rum and they opened a tasting room and gift shop in Lihue at Kilohana Plantation, a tourist destination that’s home to a railway with vintage trains that tour the farm, Luau Kalamaku, Gaylord’s restaurant and a bunch of boutiques housed in the circa-1936 mansion built by Gaylord Parke Wilcox on his sugar plantation. 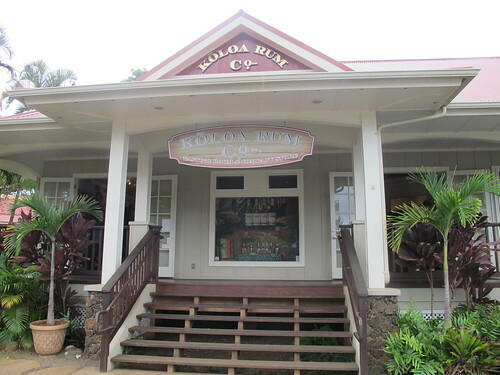 As soon as you arrive you should go inside the gift shop (located in its own plantation-style building) and ask the cashier about signing up for the rum tastings. They are held every half hour but there are a limited number of spots for each one and they can fill up quickly. However, the gift shop has plenty of stuff to occupy your time with browsing. It’s decorated with tiki mugs, small fishing floats and colorful local art — all for sale, of course. It’s clear they are masters of merchandising here, putting their company logo on mini bottle magnets, coffee mugs, shot glasses, flasks, hats, visors and severals styles of t-shirts. 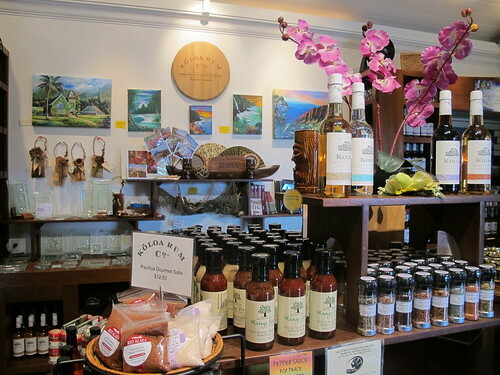 Koloa also sells a bunch of products that are made with their rums, like soaps, sea salts and buttered rum coffee, plus sister company Kukui’s tropical fruit jams and jellies. A lot of these goodies can also be found in their online store. 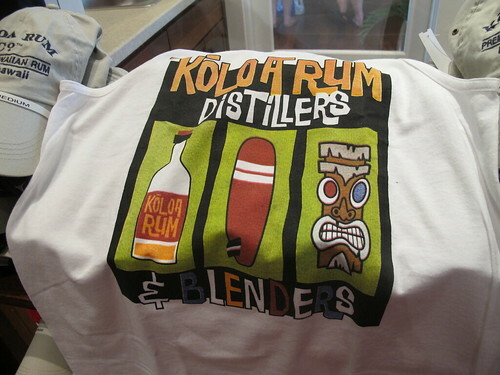 In addition to a few tiki t-shirts, they’ve also designed clothing and shot glasses (with recipes imprinted on them) to correspond to signature cocktails they’ve created, like the “Kukui Mai Tai” with a flaming tiki head, western-themed “Rum Slinger” and “The Rumpress” with a crown and pink and purple to appeal to the ladies. 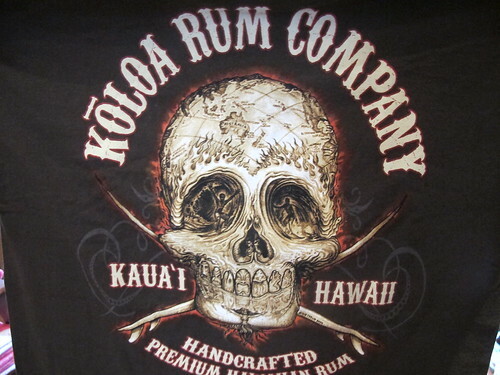 At first glance I had thought this was just a regular pirate-y shirt, but then I noticed the intricate details in the design, like the tikis for teeth, mermaids for the nose, and surfers riding waves for the eyes. 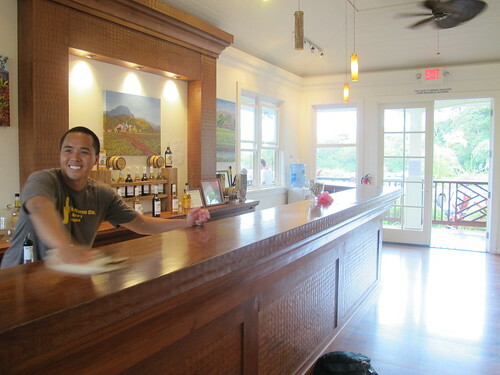 Next to the gift shop is the tasting room, a separate, light-filled space with a long teak bar (where you can spot a small green tiki) and a display with pictures of the distillery in Kalaheo, which used to be an old warehouse that had been damaged by Hurricane Iniki. 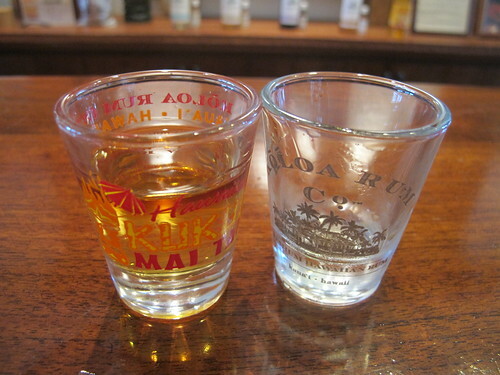 Two shot glasses were doled out to each person at the tasting — one with a bit of their Mai Tai mix. After sipping a little of the white, gold and dark rums from the other glass, we were told to pour the rest into the one with the mix to make a sort of mini Mai Tai. We also tried their spiced rum, which was my favorite of the four. 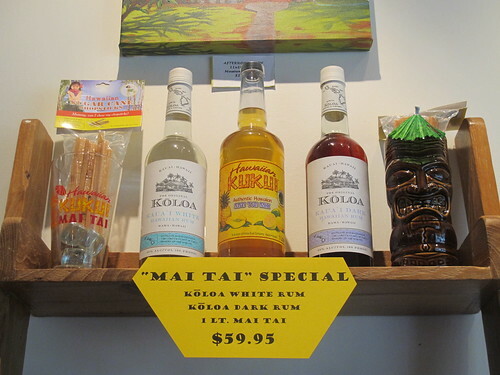 The white and dark rums each run about $30, so the Mai Tai Special would seem to get you the mix for free. Obviously it’s no traditional Mai Tai — their recipe calls for orange or pineapple juice — but I could see possibly stopping by here from the airport (it’s just a couple miles away) and picking this up to make easy cocktails at the condo. (Apparently the nearby Costco has good deals on their rum, too.) If you wanted to be even more lazy on your vacation, they also sell a ready-to-drink Hawaiian Mai Tai ($29.95) made with their gold rum. 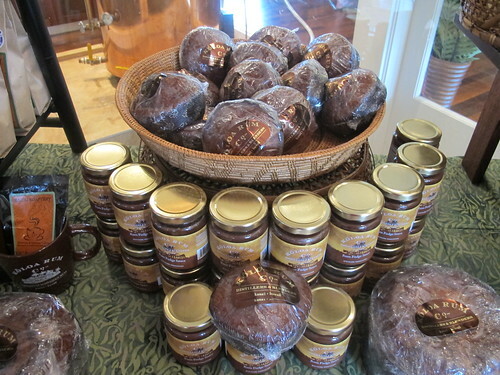 At the tasting they also brought out bites of rum cake with macadamia nuts in a (successful) ploy to get folks to buy it ($7.50 for small, $25.50 for large). We opted for the $18.95 combo of a small cake plus the rum fudge sauce, which costs a whopping $15.50 on its own. I liked that they had sample bottles (50 ml for $4.95) that were a bit more wallet-friendly (and carry-on friendly), that way I could bring a few home to see how they go with the cocktails I like to make. 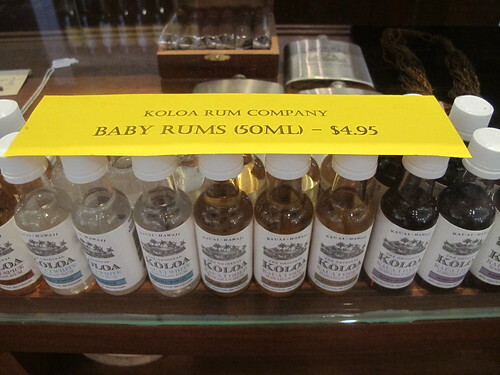 At least in Southern California, Koloa Rum isn’t too hard to find. 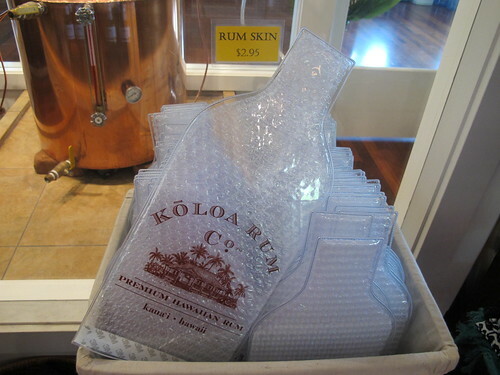 If your state has less enlightened liquor laws, you can try protecting a bottle in your luggage with one of their rum skins ($2.95). However, it might be more convenient to order online — Mel & Rose apparently ships to all states, while Hi-Time Wine Cellars has good shipping rates for California and Arizona. 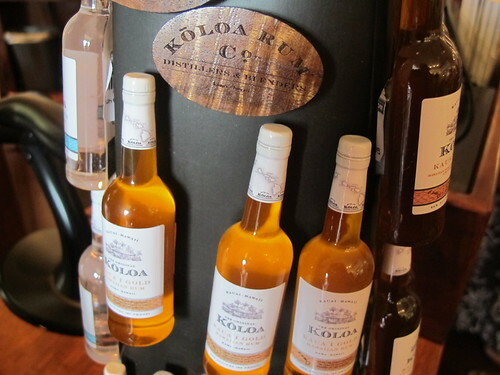 Koloa Rum Company is open every day for tastings starting at 10 a.m. Closing hours vary depending on the day (usually around 3 p.m.) but on Tuesdays and Fridays they stay open later for all the people going to Luau Kalamaku, with the last tasting at 7:30 p.m. and the gift shop open until 9 p.m.
Hhm, this past summer I was pretty much exclusively drinking Cruzan black strap and soda. I really dig how the seltzer brings out the sugar cane flavor. Might have to see if I can get my hands on this stuff. Thanks for stopping by, Mantan! I’m no rum expert, so I couldn’t comment too much on their quality. Great tour of our tasting room and company store, cheers! Bought coconut tonight after trying. Really liked it. I’ve heard it’s really good. I’ll have to try it for myself soon!